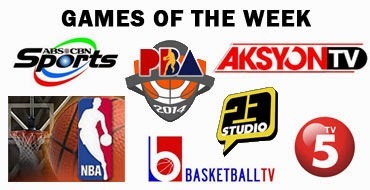 TV Schedule: Games of the Week (January 12-18, 2014) - Balita Boss! Here’s a look at the games of the week scheduled on television. TV: Live on ABS-CBN / Replay on Studio 23 - 9:30 p.m.
TV: Live on AksyonTV and Fox Sports Philippines / Replay on TV5 - 11 p.m.
TV: Live on AksyonTV / Replay on TV5 - 11 p.m.